The Cathedral of St. James, also known as the Santiago Cathedral, is an old and charming cathedral in the city of Bilbao. It is one of the oldest cathedrals in Spain, with its origins probably dating back before 1300, which makes it older than Bilbao itself. The Cathedral of St. James is well known for its status as a historical beauty, with an excellent exterior that has been well maintained through the ages, and splendid interiors to match. The Cathedral honours the apostle St. James the Great, and just like many other churches in Spain, the architectural style is more of a mix of different eras rather than one particular style. It ranges from the classic Gothic influence on the designs of the cloister and the main vault, to the grandiose outer façade and massive spire, inspired by the flashy Gothic Revival style of the 18th century. Even to a layman, the sheer beauty of the Cathedral is there for everyone to see. Inside the church, there are a total of 15 chapels, impressive choir stalls as well as a very intricate crypt. There are some interesting stone carvings, made by local merchants along the walls of the main vault, a custom that carries on even today. You need to pay €1 to enter the cloister area, but the splendid architecture inside makes it well worth the money. What is most impressive about the Cathedral of St. James is how well it has been maintained for centuries now, and the stained glass windows inside are very impressive indeed. There is also a lovely fountain in the square in front of the church. All in all, the Cathedral of St. James isn’t just a historical masterpiece, but a great place to unwind and relax with the family. The Cathedral of St. James is only a short walk down from the centre of Casco Viejo. The Cathedral opens up to Correo Street, which is a great place to shop for mementos. The best time to visit the Cathedral is during evening mass, where the scores of candles make for a hauntingly beautiful atmosphere. Watch out for beggars, who tend to congregate on the square outside the cathedral asking for alms. Due to its proximity to the many markets of Casco Viejo, there is quite some traffic coming in during the evening, something you should consider while planning your visit. Bus Stop: Viuda De Epalza- 38, A2153, 62, A3324. How popular is Cathedral Of St. James? People normally club together Fingerprint Sculpture and Teatro Arriaga Antzokia while planning their visit to Cathedral Of St. James. Very beautiful structure with an interesting history. Definitely worth a quick stop in to see and dont miss the cloister outside! Also a 5€ adult ticket here gets you in at the other church too. Iberia: One of the first lessons you must learn in Bilbao is ‘going for pintxos or tapas’. The tradition is similar in numerous Spanish cities, such as Granada, Salamanca and Madrid. But the ‘tapas’ from the Basque Country have a great reputation, gained from hard work and experimentation. You are bound to love them. Going for tapas in the Old Town is one of the best ways to get to know the old area of Bilbao, commonly referred to as the ‘seven streets zone’. We recommend starting your gastronomic itinerary at the bars surrounding St. James’ Cathedral, where you can easily lose track of time. This area is a mixture of terraces, bars and shops, all with a beautiful stone backdrop. End your route in the area around Unamuno Square and New Square, which are bursting with life both day and night. We recommend sampling the seafood specialities, such as the beloved dish of ‘rabas’ (calamari), and remember the saying: “one pintxo should be eaten in only three bites”. 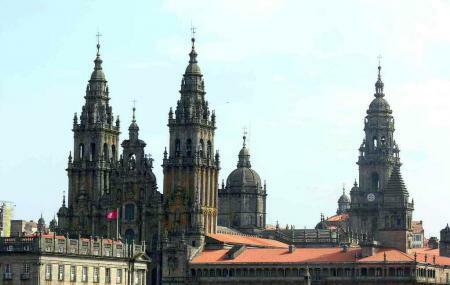 Beautiful well-maintained cathedral in the heart of the old town. Not too crowded. It gets 5 stars because of the good audioguide. 09/04/2019 Catedral de Santiago (St. James' Cathedral) Santiago Cathedral is a Roman Catholic church in the city of Bilbao. The temple was originally built during the 14th-15th centuries as Bilbao's main parish church, and was only declared cathedral in 1950 when the Roman Catholic Diocese of Bilbao was officially created.